If you love to ski, you’ll love staying at Christmas Farm Inn and Spa during the winter of 2015. When you step outside the front door to our Jackson NH inn, you literally have the region’s top cross country ski area, the Jackson Ski Touring Foundation, right there before you, offering 148 km of trails in and around Jackson that are ready to explore. The foundation works to have a well-groomed trail system that offers something for everyone, from first-timers to snowshoers to national competitors. There are also 9 alpine slopes just minutes away. Several of these offer ski and board schools for those new to skiing. Kids’ programs and child care make them great choices for the whole family. Black Mountain is just a mile from the Inn, offering 40 trails and four lifts with a 1,100 foot vertical drop! This is a great choice for families because of a focus on safety and high quality ski programs for the whole gang. Experienced guests can enjoy the thrill of the Upper Maple Slalom. Adults can save up to 13% on weekend and holiday rates by booking through Christmas Farm Inn for 2015. Enjoy a cold one at the Lostbo Pub after an afternoon of skiing. Wildcat Mountain sits about 15 minutes away from our inn and offers 225 acres of property with 47 trails and four lifts. Wildcat has a 2,112-foot vertical drop that can be quickly accessed via chairlift. We can save adults up to 33% off regular prices when booking midweek and 16% when booking on weekends and holidays. Wildcat has a cafeteria on the main level of the main base lodge and a pub. Also about 15 minutes from us is Attitash, which contains 70 trails and 12 lifts on 280 acres with a 1,750-foot vertical drop. Booking through Christmas Farm Inn can save adults 33% midweek off regular rates. The same company owns Attitash and Wildcat Mountain so joint lift tickets are available in the winter. You can enjoy a cold one at Ptarmigan’s Pub, and a number of events are planned at Attitash in the months ahead. Some 9.3 miles from our door in North Conway Village is Mount Cranmore. There you’ll find 40 trails and 10 lifts on 200 acres with a 1,200-foot vertical drop. The facility is celebrating 75 years of serving the community. You’ll also see us mentioning Cranapalooza a good bit on our Calendar of Events. Held every Saturday during the winter, this festival includes fireworks, music, children’s entertainment and more. Booking Cranmore through Christmas Farm Inn saves adults 34% off mid-week regular rates and youths can save as much as 56% off regular prices on weekends through us. 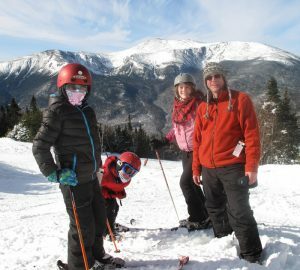 About a half-hour from Christmas Farm Inn is Bretton Woods, the largest ski area in New Hampshire, boasting 101 trails and 9 lifts on 434 acres with a 1,500 foot vertical drop. They also offer zip lines, sky bridges, and rappels, dog sledding, snowshoeing, tubing, ice skating, and more. Booking through Christmas Farm Inn can save adults 26% midweek and teens 16% midweek off regular prices. Even if you don’t know how to ski and don’t particularly care to learn on your next trip, these resorts offer more than just activities for skiing. Remember to bring proper outdoor winter attire, dressing in layers so you can add or remove clothing as conditions and temperatures change. Helmets are recommended, as are goggles or sunglasses. We recommend when you visit these slopes, allow at least 45 minutes to an hour to allow adequate time for any equipment you need to rent and getting where you need to be to enjoy your adventure.